At a quick glance you will see the simularities in both the magnetic and the temperature maps over the northern hemisphere. 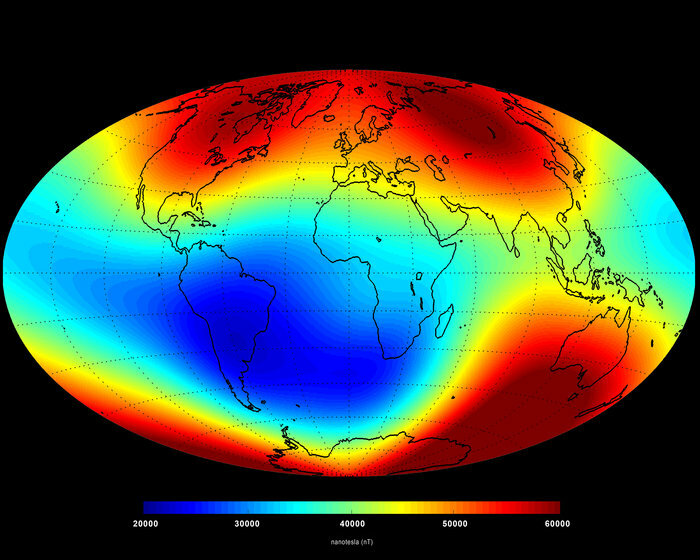 You will note that the coldest regions are by no coincidence in the same regions of strongest magnetic fields. We are working on why the southern hemisphere is different, in that the lower right on the magnetic map shows a larger flaring, but although the temperature map clearly shows this region being cooler than on the left side it does not flare up like the magnetic map flares up to the equator, nevertheless we can denote from comparing the both maps that it is by no coincidence they are linked, as experiments were conducted with magnetic bearing material that were subjected to heat, it was found when the magnetic material was heated it lost its ability to hold magnetism, the conclusion drawn from this experiment was that where warming took place the magnetism decreased, and when subjected to cooling it held its magnetism, now when we apply this knowledge to temperature maps we see that the coolest regions of the earth are the regions where the strongest magnetism is, of course we are talking of where the earths magnetic poles are in arctic and antarctic regions, so to confirm this we should see very little magnetism in the warmer regions or none at all, and looking at the magnetic map above we see this is the case when compared to the temperature map. A good example is the equitorial region obviously, but not so for the north of the United Kingdom on the temp it shows it warmer than the arctic and on the magnetic map it shows in this regions magnetic field strength to be weaker. One other thing to mention with regard to this region above the UK is that over the last 5 years we have been monitoring it, and we see that not only is the region weakening in magnetism but it is increasing in latitude and widening as it moves further north, and this could indicate that the northern magnetic pole is splitting apart, we have also noticed that as the north pole splits apart in the direction of east and west, those edges of the magnetic plumes move closer to the equitorial region and as a result the climate is changing in these regions in favour of a more colder, and in some cases arctic climates especially during winter months, this is having detrimental effects on farming and food production in these regions, and sadly it is going to get a lot worse before things get better especially when we compare solar data and the low yeilds of sun spots at present, obviously low numbers of sun spots equates to low mean surface temperatures as is evident by monitoring the solar outputs during the maunder minimum and the daulten minimum, so to briefly summarised not only is the pole migration affecting the climate, but so is the low yield of sun spots which are halving every 11 years, could we also be facing a return to the ice age, records suggest we should be in a glacial period right now.